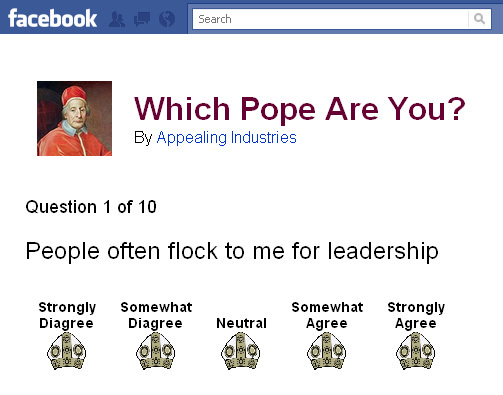 Appealing Industries: Which Pope Are You? Have you ever looked at someone and knew they totally reminded you of a medieval pope, but you couldn't quite place which one? Have you ever wondered which pontiff was most like YOU? Well wonder no more! This is the perfect opportunity to discover your illustrious doppelganger. Just answer only ten quick questions and our patented PopeMatch™ technology will pair you with your holy twin! Take the Quiz on Facebook Today!